Back up anything that’s important to keep – you need at least two copies in separate places. You should really use two separate types of storage too, such portable hard drives, flash drives, or online ‘cloud’ storage, making sure you use reputable suppliers and products. CDs or DVDs aren’t recommended, as they degrade relatively swiftly. But hard drives are not completely safe either – I’m thinking of the number of drives I’ve had to recover data from for clients. Digital files corrupt easily, and software, hardware, and file formats can become obsolete due to the rapid advances in technology, so you’ll need to create new archival copies at least every five years – maybe sooner if you buy a new computer – to ensure your files remain compatible. 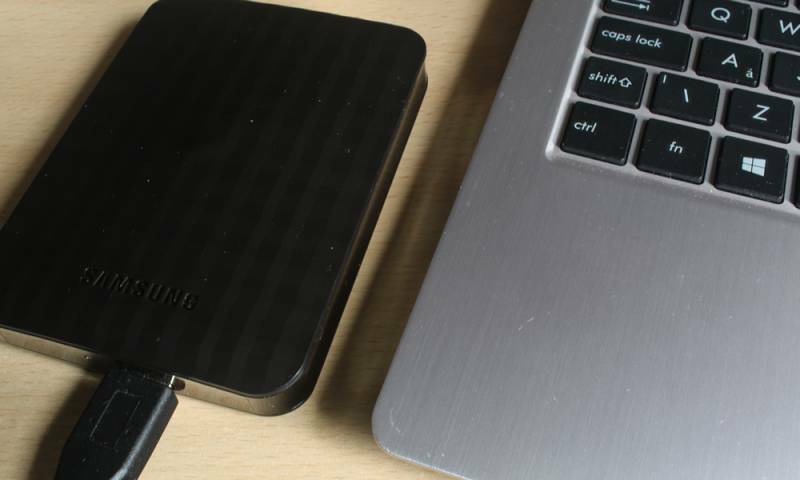 Although I use online cloud storage, I also use external hard drives, like the one pictured above. These come into their own if your’re travelling / on holiday and have limited access to WIFI and therefore cloud storage. Windows has built in ‘backup’ software. But it’s also easy to just copy and paste the stuff you want to save onto the external hard drive. Windows 10 includes several backup tools – File History and Windows Backup tool (removed from Windows 8.1 but now available in Windows 10). File History, introduced in Windows 8, reappears in Windows 10. It’s still the recommended way to back up. That’s why File History is integrated into both the new “Settings” app and the old Control Panel, while Windows 7’s backup feature is only available in the Control Panel. File History only backs up files located in your user account’s libraries. So your files, say in Downloads, may not be backed up. In File Explorer you may need to add folders to these libraries if you want to backup files stored in other folders. Choose a folder you want to include in a library and, right click and select ‘Include in library’. Then pick the library you want, or create a new library. Once you’re done, Windows can automatically create backup copies of your files. You can use it to restore all your files if you ever lose them, restore a single file, or roll back a file to an older version. This tool will allow you to restore any old Windows 7 backups on your Windows 10 computer. But you can also use it to back up your Windows 10 PC in the exact same way you’d back up a Windows 7 PC. Unlike Microsoft’s new File History backup solution, you can use Windows Backup to more easily create a backup of practically everything on your hard drive. You’ll find this tool in the Control Panel — just search for “backup” to locate it. If you need additional help with backing up your important data or system files, please contact me.